Our media partners are invited to attend as the 2019 Pedal for Hope team cycles into Peterborough the week of April 29, 2019. In the past 14 years Pedal for Hope has raised more than $5.1 million for paediatric cancer research. Pedal for Hope has directly funded two research doctors at Sick Kids Hospital in Toronto and now a doctor at the University of British Columbia. During this year’s tour the team will be making an announcement regarding an exciting project that will be funded through donations raised in 2019. Pedal for Hope was created right here in our own community by the Peterborough Police Service. Starting in late April for three week the Pedal for Hope team cycles throughout Central Ontario visiting local schools and delivering a message about kids living with cancer. The team members, comprised of officers from the Peterborough Police Service, Durham Regional Police Service and OPP along with many volunteers and members from our Auxiliary Unit, are all volunteering their time to be a part of this team. The team is currently riding for 21 children living with cancer or in remission. The Peterborough Police Service is asking for the public’s assistance in locating a missing female youth from the Peterborough area. Alexis “Lexi” Davidson, 15 years, was last seen leaving a Monaghan Road area apartment at approximately 3 pm on the 11 April, 2019. Davidson is described as Caucasian, 5’0″, thin build, short brown hair, last seen wearing grey winter boots, grey track pants, burgundy St. Pete’s hoodie and black back pack. A photo is attached for assistance. A 39-year-old Peterborough man has been arrested and charged with trafficking cocaine along with numerous Highway Traffic Act offences following a Tuesday morning vehicle stop. On April 23, 2019 at approximately 10:45 a.m. an officer saw a motorcycle with no licence plate traveling south on George Street and conducted a vehicle stop. Through the investigation it was revealed that the driver was operating the motorcycle while his licence was under suspension and with no insurance or permit. The accused was initially placed under arrest for drive while under suspension. During the investigation officers located an amount of cocaine and drug paraphernalia, including a digital scale, in the accused’s possession. The accused was held in custody and is scheduled to appear in court later today (April 24). The Peterborough Police Service is asking anyone with information to come forward following a break-in at a local elementary school during the Easter long weekend. At approximately 8:35 p.m. on April 20, 2019 unknown person(s) broke into a Monaghan Road school. Once inside the person(s) damaged a smartboard and an iPad inside a classroom and stole two iPads. The Peterborough Police Service has arrested and charged a 23-year-old Peterborough man with two counts of domestic assault following an investigation. On April 14, 2019 the accused and female victim became engaged in a verbal argument. It was reported to police that during the argument the accused assaulted the victim. Through the investigation it was also revealed that during an argument that occurred between March 24, 2019 and April 6, 2019 the accused had assaulted the victim. On April 24, 2019 officers attended a Peterborough residence where, as a result of the investigation, the accused was arrested and charged with domestic assault X2 and fail to comply with a probation order X2. The accused was released from custody and is scheduled to appear in court on May 7, 2019. In order to protect the identity of the victim in this domestic incident the name of the accused will not be released. The Peterborough Police Service is investigating following a break-in at a City residence. Sometime between 5:10 p.m. on April 17, 2019 and 9 a.m. on April 18, 2019 unknown person(s) stole a number of tools from a Dominion Crescent residence that is currently under construction. On Saturday April 20, 2019 at approximately 12:30 p.m. police, fire and EMS attended a Lansdowne Street West gas station for a fire. During the incident a 34-year-old Peterborough man was injured. The male was initially taken via EMS to a local hospital then subsequently transported to a Toronto-based hospital where he remains. The investigation is ongoing and updates will be provided when available. A 59-year-old Bridgenorth, Ontario man has been arrested and charged with impaired driving following a motor vehicle collision. Shortly after 9 p.m. on April 18, 2019 police received a call for service regarding a motor vehicle that had struck an Otonabee Drive residence. Police also received information that the suspect vehicle had struck another vehicle before colliding with the home. Police, fire and EMS were dispatched to the scene. While speaking with the male driver of the vehicle officers noted a strong odour of an alcoholic beverage coming from the driver’s breath. A subsequent breath test revealed the driver had more than the legal limit of alcohol in his system while operating a motor vehicle. The driver was taken to a local hospital for treatment to any injuries and released. As a result of the investigation Lawrence Michael Loyst, 59, of Communication Road East, Bridgenorth, is charged with operation while impaired – blood alcohol concentration 80 plus. The accused was issued an automatic 90 day drivers licence suspension and seven day vehicle impoundment. The accused was released from custody and is scheduled to appear in court on May 15, 2019. A 39-year-old Innisfil, Ontario man is facing several charges including assault and causing a disturbance following an incident. On April 18, 2019 at approximately 7:30 p.m. police were dispatched to the area of Romaine Street for reports of an intoxicated male causing a disturbance by running up and down the street screaming and attempting to engage numerous other persons in a fight. It was reported that during the incident a female was assaulted. Officers arrived on scene and located the male. During the investigation the male provided officers with a false identity. The accused was held in custody and appeared in court on April 19, 2019. The Peterborough Police Service has arrested and charged a 22-year-old Peterborough man with carrying a concealed weapon and possession of a weapon for a dangerous purpose following a weekend incident. On April 20, 2019 at approximately 11:20 a.m. police attended a Landsowne Street West mall for reports of a male in the food court who had brandished a knife while seated at a table. Officers attended and located the male who, through the investigation, was found to be in possession of a concealed pocket knife. The Peterborough Police Service would like to thank the community for their generous donations during the annual Easter Tolls for Special Olympics. On Saturday April 20, 2019 voluntary exit tolls were held at six locations throughout the City. Members of the Auxiliary Unit, Special Constables, Torch Run Team members, Canine Unit Constable Cowie and Police Service Dog Isaac, civilians, Fleming College students and family members collected more than $ 32,000 for Special Olympics Ontario. The tolls have been held the same Saturday for nearly 25 years and the people of Peterborough and area continue to give generously each and every year. These funds will support special athletes across the province and directly here in Peterborough for sports and other important programs. People of all ages can ride a bike. As a cyclist, you must share the road with others (e.g., cars, buses, trucks, motorcycles, etc.). Under Ontario’s Highway Traffic Act (HTA), a bicycle is a vehicle, just like a car or truck. You must stay as close to the right edge of the road whenever possible, especially if you’re slower than other traffic. By law, every cyclist under age 18 must wear an approved helmet. Riders under 16 years old: a parent or guardian must make sure their child wears a helmet. Helmets are not compulsory for adults over 18; but a helmet can greatly reduce the risk of permanent injury or death if you fall or collide. It is strongly recommended that all riders wear helmets. Q1: What new changes do cyclists need to know about? Q2: Why did the province pass legislation for bicycle signals? Bicycle traffic signals are expected to improve safety at intersections and help reduce collisions with pedestrians and drivers. Q1: What is the penalty to drivers for not leaving a minimum of one-metre distance when passing a cyclist? The penalty for not leaving a minimum one-metre passing distance is a set fine of $85.00 plus a $5 court fee plus a $20 victim surcharge fine for a total payable of $110.00. Drivers who contest their ticket by going to court may face a fine of up to $500 if found guilty (fine range is $60 to $500). Upon conviction, two demerit points will also be assigned against the individual’s driver record. Q2: Will cyclists also be required to leave a minimum one-metre distance when passing a vehicle? Cyclists are not required to leave a specific one-metre space; however, they are required to obey all the rules of the road. Cyclists who are being overtaken should turn out to the right to allow the vehicle to pass. Q3: What if there isn’t enough room to allow for a one-metre passing distance? Can a vehicle cross the centre median line to pass the cyclist? A motorist may, if done safely, and in compliance with the rules of the road, cross the centre line of a roadway in order to pass a cyclist. If this cannot be done, he or she must wait behind the cyclist until it is safe to pass. Q1. What are the new increased penalties for “dooring” offenses? The new penalties for improper opening of a vehicle door (for driver or passenger) are a set fine of $300.00 upon conviction and 3 demerit points. The total payable fine is $365.00 ($set fine plus $60 victim fine surcharge and $5 court costs). The current HTA set fine for “dooring” offence is $85.00 upon conviction and the total payable fine is $110 ($set fine plus $20 victim fine surcharge and $5 court fees). Additionally a conviction results in 2 demerit points being added to the individual’s driver record. Q2. Does the “dooring” law only apply to cyclists? Although cyclists may be the most commonly perceived road user affected by this behaviour, the “dooring” law applies to all road users and is not specific to cyclists. The government is committed to helping ensure the safety of not only cyclists but all road users. Q1. Why is the government increasing the fines for cyclists with improper light, reflector and reflective tape? Currently, the fine for non-compliance with bicycle light, reflector and reflective requirements, carries a maximum fine of $20 which is less than the majority of set fines for motorists and cyclists. Increasing this fine will put this violation in line with all other cycling violations. Q1. Why is the government allowing cyclists to use a red flashing light? Won’t this be distracting to other road users? Red flashing lights were previously not allowed under the Highway Traffic Act even though the majority of cyclists were already using rear lamps that produce intermittent flashes of red light to make themselves more visible to others. Considering the safety benefits from the use of these lights, and to prevent cyclists from potentially being charged, the Highway Traffic Act was amended to allow bicycles to use lamps that produce intermittent flashes of red lights. Q1: What is the fine for not wearing a bicycle helmet? 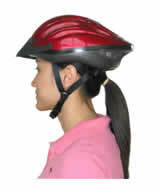 All bicycle riders under the age of 18 need to wear an approved bicycle helmet when travelling on any public road. The total fine is $75. Q2: How do I know which bicycle helmet to buy? A 31-year-old Peterborough man has been charged with domestic assault and uttering threats following an investigation. On April 15, 2019 the accused attended the Peterborough residence where the victim was staying and threatened to harm members of the victim’s family. The accused and female victim have been in a domestic relationship for several years. The incident was reported to police and officers investigated. During the investigation it was further reported that in 2016 the accused assaulted the victim. As a result of the investigation on April 17, 2019 officers attended a Peterborough address where the accused was arrested and charged with domestic assault and uttering threats to cause death or bodily harm. The accused was held in custody and is scheduled to appear in court later today (April 18). In order to protect the identity of the victims in this domestic incident the name of the accused will not be released. Two Peterborough-area residents are facing drug and possession of stolen property charges following an incident at a local swap shop. On April 17, 2019 police attended a George Street swap shop in response to a male and female attempting to pawn a stolen shallow well jet pump. As a result of the investigation the co-accused, still at the store, were placed under arrest. During the search incident to arrest both accused were found to be in possession of drugs. The accused was released from custody and is scheduled to appear in court on May 8, 2019. The Peterborough Police Service is investigating after two granite grave monuments were stolen from outside a local business. Sometime between approximately 5 p.m. on April 16, 2019 and 9 a.m. on April 17, 2019 unknown person(s) attempted to break into an Aylmer Street North monument business but were unsuccessful. The suspect(s) went on to steal two granite tombstones with bases that were on display outside the business. On Saturday April 20, 2019 between 8:30 a.m. and 5:30 p.m. members of the Peterborough Police Service and local volunteers will be at the exits of six participating businesses throughout the City collecting donations for Special Olympics. Any donation large or small is greatly appreciated! Members of the Auxiliary Unit, volunteers and members of the Service collecting donations for Special Olympics. A 40-year-old Peterborough man is facing several charges following break-ins at two Hunter Street West restaurants and the theft of truck from a downtown parking lot. On April 14, 2019 an unknown male attended a Hunter Street West restaurant where he attempted to break into the restaurant then left the area in the victim’s truck that had been parked in the lot. When the male attempted to drive away he backed into a shed, causing damage to the vehicle and shed. Through the investigation the male was identified. On the night of April 16, 2019 an officer located the accused in the downtown area where, as a result of the investigation, he was placed under arrest. Through further investigation it was revealed that the accused was connected to another break-in at a Hunter Street West restaurant also on April 14, 2019 where an amount of cash was stolen from the till. The accused is additionally charged with break and enter and fail to comply with a probation order. The accused was held in custody and is scheduled to appear in court later today (April 17). The Peterborough Police Service has arrested and charged a 21-year-old man with impaired driving and drive over 80mgs after conducting a traffic stop of a vehicle travelling the wrong way down George Street North. At approximately 6:30 a.m. on April 14, 2019 an officer saw a vehicle travelling east on Brock Street make a left turn onto George Street North travelling in the wrong direction. The officer activated his emergency lights and conducted a vehicle stop on George Street North. A subsequent breath sample revealed the driver had more than twice the legal limit of alcohol in his system while operating a motor vehicle. The accused was released from custody and is scheduled to appear in court on May 2, 2019. The Peterborough Police Service is asking anyone with information to come forward following a break-in at a Hopkins Avenue home. Sometime between February 9, 2019 and April 4, 2019 unknown person(s) broke into a Hopkins Avenue home while the homeowners were away. Once inside the thieves stole an amount of jewellery. A 48-year-old Curve Lake, Ontario man has been charged with domestic assault; fail to comply with an undertaking and breach of probation following an April 2019 incident. On April 16, 2019 the accused and female victim became involved in an argument at a local Peterborough Hotel. During the argument the accused assaulted the victim. The incident was later reported to police. On April 16, 2019 the accused was arrested by Peterborough Police and transported to the station. The accused was held in custody and will appear in court on April 16th.